The Juji platform has many built-in capabilities for creating a full-fledged conversational agent for most common use cases. When your needs go beyond these built-in capabilities, Juji put in your hands a simple yet expressive language called REP, so that you can harness the full power of the platform. Additionally, Juji platform contains an integrated development environment (IDE) for working with REP scripts. In the editing dialog of a question, click on Write Custom Topic link, a topic editor is expanded in place. The topic editor contains a skeleton of a topic that you may edit to fill in rules to handle user's responses to this question. Click Compile to compile and any syntax error will be reported. 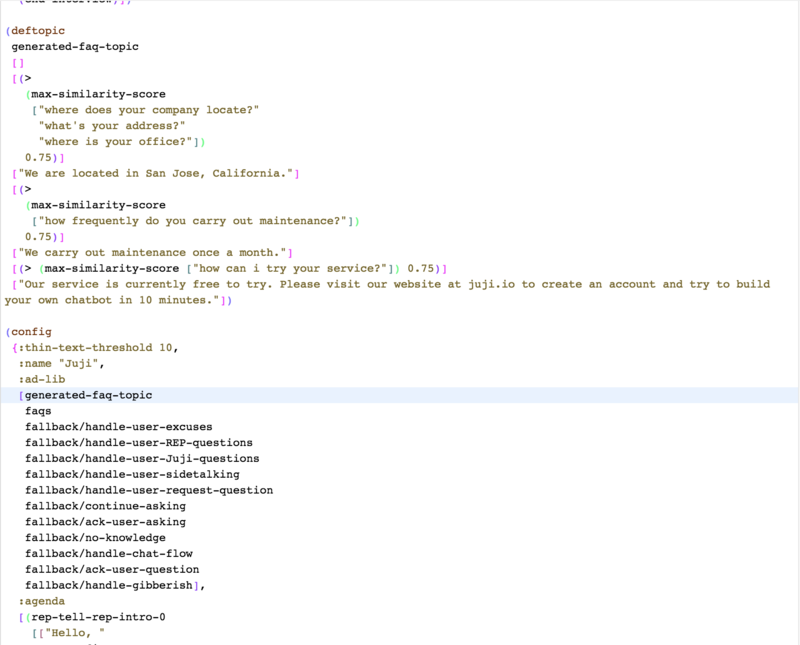 At https://juji.io/ide, you have access to an online scripting environment. To access the IDE page, you can also click on the word "Advanced" in the Juji app Design View. On the left side of the environment, you have a file browser showing all your scripts and config files. The files are organized by the bot applications you have created, each called an Engagement. Each Engagement contains a Config document, which reflects the Design View of the bot; a Preivew release, which has the script powering the preview chat; and a number of Web, Facebook, or Slack releases, which are your production releases of the bot scripts. On the right side of the environment, there is a code editor containing the file you select in the file browser. The editor has syntax highlighting, rainbow parentheses, and brackets mismatch errors are detected on the fly while you are typing. The custom script file has a namespace ending in .custom. Such a file is where your custom topics are saved. You can also freely write your own topics and functions in that file. You can Upload a file to replace the file, or Download the file to your local disk, or Save the file in the Juji platform. The main script file of a release has a namespace ending in something like .web2, where web the name of the release channel, and 2 means the second release of this engagement in that channel. In addition to Upload, Download, and Save, the main script also supports Compile and Preview functionality, where you can see your script in action immediately. This document shows the high level structure and content of your engagement. Sometimes it is easier to edit content in the config document rather than in the script files. When click Generate Script pull down menu, a new release can directly be created right there. You may have already prepared answers to some frequently asked questions that you want to import into the script. Juji provides a command line tool for you to convert the FAQ and answers into REP script snippets, and you can then paste them into your script in IDE. Before you start, please make sure you have installed Java 6 or higher and you are familiar with general concepts of Juji script. The first column lists the questions. The second column lists the corresponding answers of the first column's questions. One row can only have one answer. But there can be multiple questions in the same row, which means these questions share the same answer. Basically, these are different examples of the same question. These example questions should be separated by newline characters. The first row is assumed to be the header. Here's an example FAQ csv file. The ability of Juji bot to recognize FAQs depends on the number of example questions you give. So it is recommended that you give multiple forms of the same question as examples. You can also run the program with the help option to see all possible options. Running the faq-parser produces an edn file containing one deftopic. ["where does your company locate?" Once you have your csv file converted, you need to copy the deftopic form from the edn file into your main chat script. You can paste it anywhere that has the same global scope as other deftopics. Then, in your script, find the :ad-lib key and its vector value in (config ...), and add the name of the deftopic to be the first item in that vector. By putting your deftopic at the beginning of the :ad-lib vector, the REP will check it before all other FAQs. On the other hand, you can generate multiple FAQ topics and place them in the :ad-lib vector in the order you desired. At this point, you may save and compile the script. Now your self-defined FAQs are added to your chatbot.